This is another one of those that I saw on a restaurant menu and made a few notes to make it at home…so, yesterday we had some friends over and they were my guinea pigs…I think they liked it – not a crumb was left on anyone’s plate. Another winner! Heat the oven to 350°F. 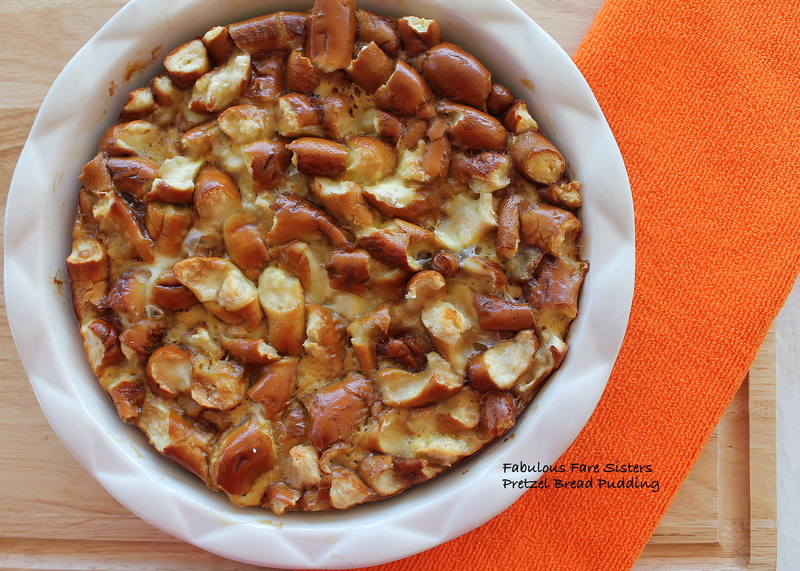 Break baked soft pretzels into bite-sized pieces and lay a first layer in a deep round pie dish. 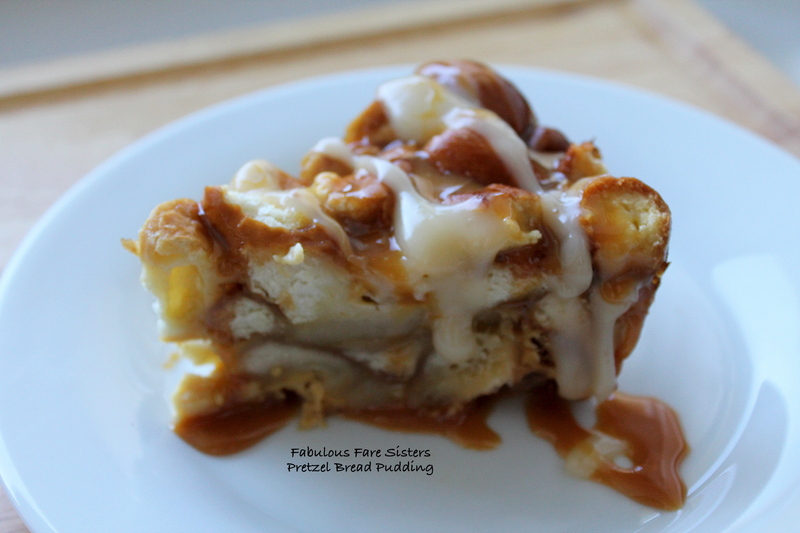 Drizzle with one heaping tablespoon of Salted Caramel Topping. Continue layering the soft pretzel pieces on a second layer. Drizzle with another heaping tablespoon of Salted Carmel Topping. In a mixing bowl, whisk together the whole milk, vanilla, sugar and salt. Pour over the pretzels and press to soak in. Cover with aluminum foil and bake 50-60 minutes. Remove from heat. Make the Vanilla Cream Sauce. Place all ingredients in a small saucepan. Heat on low-medium low heat until bubbly and slightly thickened. Remove from heat and cool slightly. 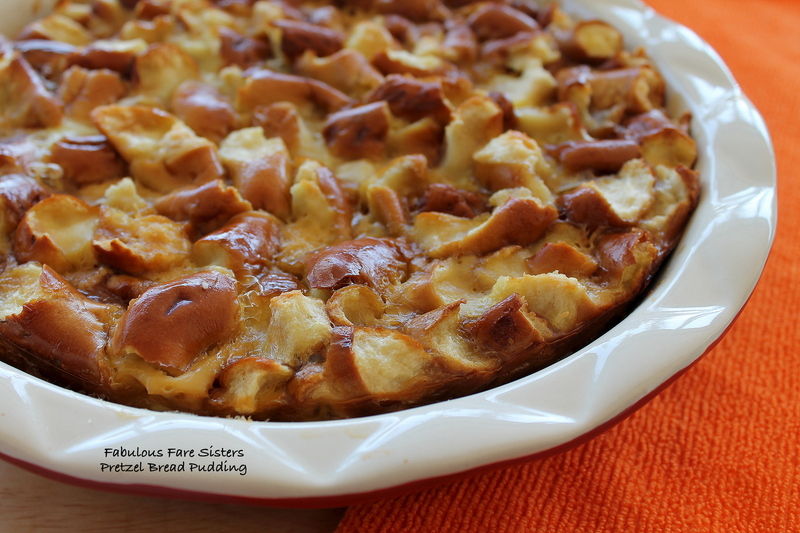 Slice Pretzel Bread Pudding into servings and drizzle with more Salted Caramel Sauce and Vanilla Cream Sauce. For an even more decadent dessert serve with a dollop with Vanilla Ice Cream! YUM! I’ve shared this recipe at Fiesta Friday and the Pin Junkie Pin Party…go check it out and then go visit some other great sites! A unique idea for soft pretzels, I could see this served at a party. Thanks for sharing with Fiesta Friday. How creative and it looks absolutely delish! I am imagining this as salty sweet! Love it!! Thanks for sharing with us at Fiesta Friday! I never thought of this! Thanks, I will be trying it this weekend! Looks so impressive and delicious! Oh, this looks CRAZY good! Just decadent. What a yummilicious combination of sweet and salty flavors Linda! OMG – this sounds amazing! So unique! Must try!! This looks divine…..the sweetness and the saltiness, just what my taste buds are craving right now.